What an interesting set of assignments we’ve been given. We’re told that the first wave of Ascension is scheduled for Sept. 28 and the Reval could happen any time after Sept. 14. Hmmm…. How might the two fit together? The connecting piece, for me, is the notion of spiritual currency. It’s our spiritual currency (love and light, which are actually the same thing) that allows us to ascend. We must have assimilated (accumulated) enough love and light (spiritual currency) to allow the transformation of the carbon-based body to crystalline-based. Without that, we can’t survive in the higher frequencies of the Fifth Dimension. This is simply a matter of physics. In the afterlife world, people can visit higher dimensions as long as they’re either accompanied by a resident of that dimension who raises their frequencies briefly, or have some form of energetic talisman which also serves that purpose. But their bodies will not allow them to live there and it’s the same here. So love and light are our spiritual wealth viewed from the angle of Ascension. Viewed from the angle of the Reval, the Mother’s sacred money which we’ll be serving as stewards for, the purpose being to spread that wealth around, relieve people of debt, fund projects, etc., is again another meaning of spiritual currency. 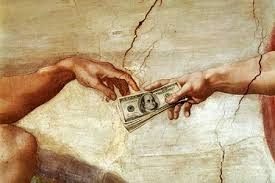 It is spiritualized or sacred currency. When we combine the two with our knowledge that the gamma, photon or X-wave energies are going to keep rising this month until the first wave ascends on Sept. 28, the very month the Reval is planned to be announced, we look out on the prospect of handling the Mother’s sacred wealth at a time of rapidly-increasing and blossoming love, something that has never happened before in modern times on Earth, as far as I know. 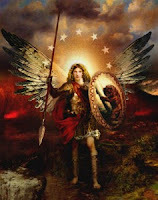 A remark that Archangel Michael made to me in a reading now begins to have significance. He asked me to take a week off after the Reval and just breathe. If the Reval happened any time after the 14th, then a week off would bring us precious close to Ascension. Was he wanting me to make no decisions until after Ascension (presuming I ascend and don’t remain behind, as a pillar)? Would it be best in any case to make no important decisions until after Ascension? I have a reading on the 16th of September and will ask him. Archangel Michael through Michael Love tells us a little bit of what to expect after Ascension: “There is a leveling off and adjustment period for a few months after 9/28 for everyone to fully integrate the new energies and to begin the detailed forming of their paradise called The New Earth!” (1) “To begin the detailed forming” of Nova Earth may mean, for those who haven’t already done so, planning what to do with their sacred wealth. How will a multitude of lightworkers, brimming over with love, manage sacred money? How will a troupe of financial wayshowers, ascended and compassionate, comport themselves and deal with others? What differences will the near-conjunction of the Reval and Ascension make? The only thing that gives me a clue is the way I feel when I’m in transformative love. If I multiply that by a few orders of magnitude and consider handling money, the prospect seems sublime. I see an army of good shepherds, of trustworthy stewards seeing to need and inequity wherever it’s found. It cannot be that all of us have foreign currency, ascend and then leave this dimension. It must be that Ascension is simply a raising of frequencies but that we “come back” from the ascended state, whether dimming it down or bringing it fully with us, and then work with those Third-Dimensional (actually Fourth-Dimensional) ones who remain (some ascended ones will choose to leave). That work will be to level the playing field, relieve dire need and in other ways prepare the second and third waves for Ascension and Nova Earth. I was interested to hear SaLuSa say that the Galactic Federation of Light has been interested in “keeping our plan secret for as long as possible.” (2) Perhaps the date of the Reval is set and they’re keeping that secret as well. And the delivery of the prosperity packages and redeeming of the historic bonds. Whatever the case, they obviously have all these matters in hand and we’re obviously meant to work with them from a nearly-ascended and then ascended space. This experiment will be ultimately fascinating to watch: ascended financial wayshowers drawing on spiritual currency to transform this world from greed and darkness to love and light. (2) SaLuSa, Sept. 11, 2015.